I have been loving this carry with my newborn. I use a size 4 woven wrap, you may be able to use a shorter wrap, as I am plus-sized. My favorite thing about the carry is that it is "pop-able", meaning I can pre-tie the wrap without my baby inside and then when I arrive at my destination "pop" her in and tighten the wrap. I can take her in and out of the wrap as needed without having to take the wrap off or re-tie. Here we are at a one week old Costco run. So, try it out! Show us how it turns out and feel free to ask any questions! 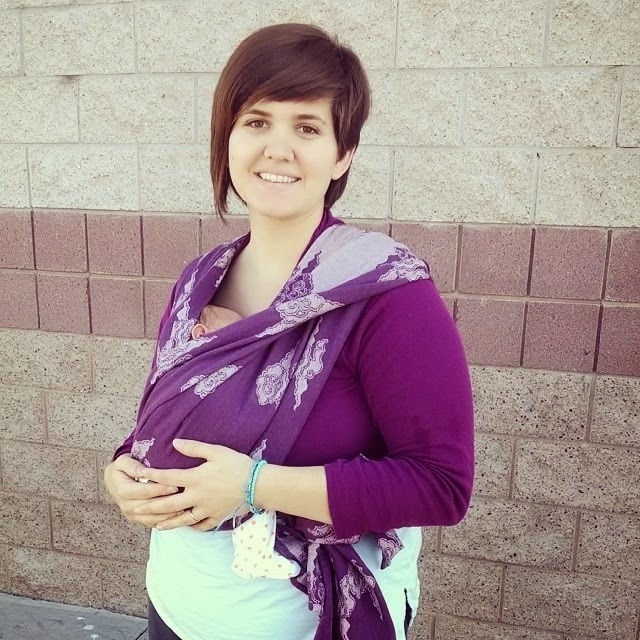 Any tutorials or advice given on this blog by Babywearing International of Phoenix or representatives of BWI of Phoenix are to be used at your own risk. Please use caution when attempting any of the carries highlighted on this blog and using any of the carriers discussed on this blog. Some of the information or advice may put some users of this site at risk due to health issues, physical limitations, or misuse. If you or your child have health issues or physical limitations, please discuss the appropriateness of the carry or carrier with your health care practitioner. BWI of Phoenix cannot be held accountable for any injuries sustained by the reader when attempting these carries or using these carriers.